Adapted By: Adapted from the original TV series by Richard Curtis and Paul Mayhew-Archer. 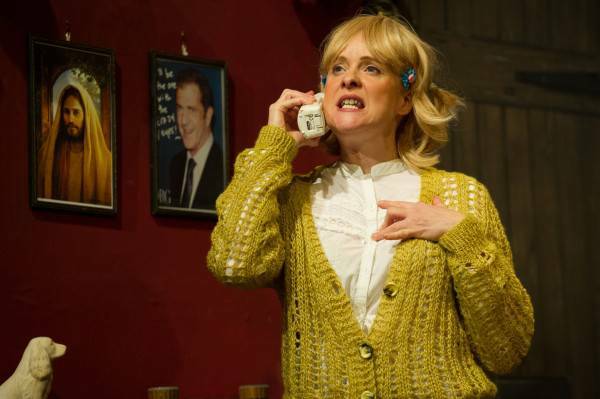 Geraldine Granger is a non-traditional, chocolate loving, rock n’ roll playing vicar, but that is not what gets the traditional and bizarre citizens of Dibley in an uproar. It’s because she is a woman! 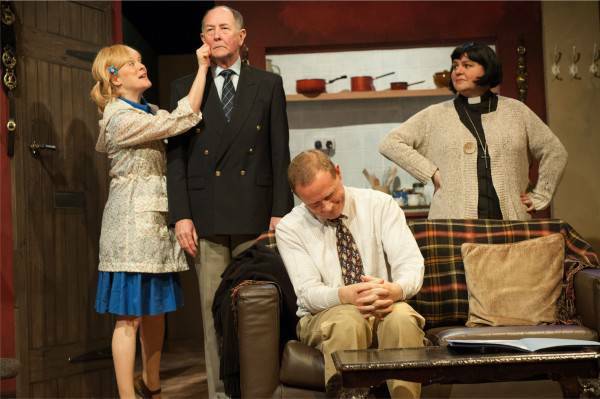 Still, that doesn’t stop Geraldine from proving her worthiness to the village in this hilarious adaptation of the popular TV comedy by the original author, Ian Gower. Ian says ?I very much hope that Garrick audiences enjoy the experience of seeing these wonderful characters come to life on stage, safe in the knowledge that all the royalties go straight to Comic Relief? The Vicar of Dibley ??LIVE! 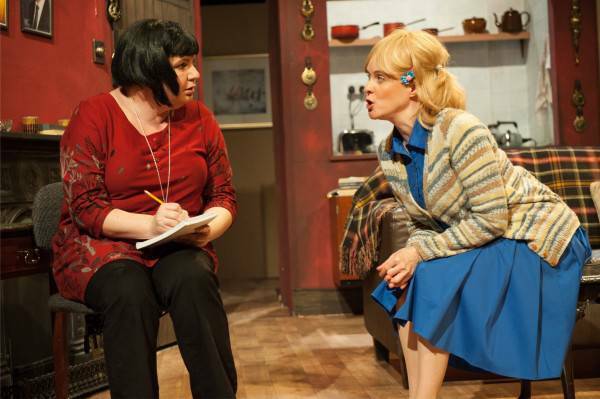 Taking a highly respected and successful TV sitcom and transporting it to the stage is not as straightforward as it might seem. Luckily, the Altrincham Garrick has the services of Ian Gower and Paul Carpenter. Gower has previous form having adapted and produced stage versions of other popular TV sitcoms like Dad?s Army and Porridge ? and it shows in this affectionate and slick tribute to?The Vicar of Dibley. For those not in the know,?The Vicar of Dibley?was a BBC sitcom that arose from from the Church of England allowing female vicars for the first time. Dawn French played Geraldine Grainger, a vicar assigned to the sleepy village of Dibley on and off from 1994-2007. Created and written by Richard Curtis (Four Weddings and a Funeral, Love Actually) it was a significant hit with its blend of characters and gentle humour. Based on those scripts, Gower and Carpenter have taken many of the more memorable sections and distilled them into the Garrick?s adaptation. From the outrage of the Parish Council at the arrival of the new, female vicar through to Alice and Hugo?s unforgettable wedding, the Garrick?s production of?Dibley?is like a greatest hits package, and a rather splendid one at that. It is testament to the cross generation appeal of?Dibley?that people of all ages were filling up the Garrick?s seats. Dawn French?s depiction of Geraldine Grainger was perfection. French?s chocolate chomping, fun loving vicar was rightly a comedy highlight of the 1990?s. Victoria Johnson has the difficult task of stepping into these shoes and pulls the role off with aplomb. An absolute triumph, she completely embodies the character and retains a slight French influence whilst still putting her own energetic and feisty mark on the character. It?s been commented that?The Vicar of Dibley?is something of an ensemble piece rather than being a vehicle for its main star. The same is true of the Garrick?s adaptation with a strong core cast of 8 sharing more or less equal stage time. ?It therefore becomes difficult to single out specific performances. Brian Pickle brings the idiosyncratic Jim Trott to life entertainingly with much of his performance prefaced with the character?s trademark ?No, no, no, no..? whilst Pat Williamson?s woeful cooking efforts as Letitia Cropley provide much amusement. David Reynolds? ruthlessly officious David Horton is the perfect foil for Bill Platt?s mercilessly pedantic Frank Pickle. However, it is Andrew Higson?s note perfect Owen Newitt with his laconic delivery and risque comments that steals the show. Higson?s performance evokes disgust and sympathy from the audience in equal measure, with him proving to have impeccable comic timing. Hugh Everett?s physicality is put to good use as Hugo Horton?s awkwardness and shy nature manifest themselves whilst around Alison Davenport?s adorably dippy Alice Tinker. Everett and Davenport go under an endurance test of sorts during the performance, the exact circumstances of which I won?t mention here ? but provided much hilarity for the audience! Celia Bonner?s direction completely gets the gentle nature of?Dibley?and makes for a formidable pairing when combined with Barry Fletcher?s excellent set design. It?s testament to the whole team that several times during the performance I caught myself believing I was watching the television version rather than a stage one. Close your eyes briefly, and you can believe you are listening to the original cast. By the time that David pleads with Geraldine to stay at the conclusion, you?re wishing you could see more of this excellent production ? and with all royalties going to Comic Relief, you have no reason not to treat yourself this Christmas. 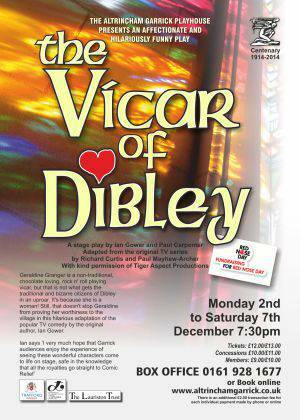 THE warm-hearted, scatter-brained Vicar of Dibley has come to Altrincham Garrick.??? She isn?t the Dawn French you saw between 1994 and 2007 but their very own Victoria Johnson. Victoria wins our hearts in? this re-run of old episodes especially adapted for stage by Ian Gower and Paul Carpenter.?? She gets into scrapes, mostly of her own making, and tells the familiar, corny jokes. She comes across as a woman who loves life and is, consequently, loved back by the audience. Other familiar characters remind us of how funny this series was.?? We have inspired performances by Ali Davenport as the Rev?s sidekick, the dopey verger, Alice,? 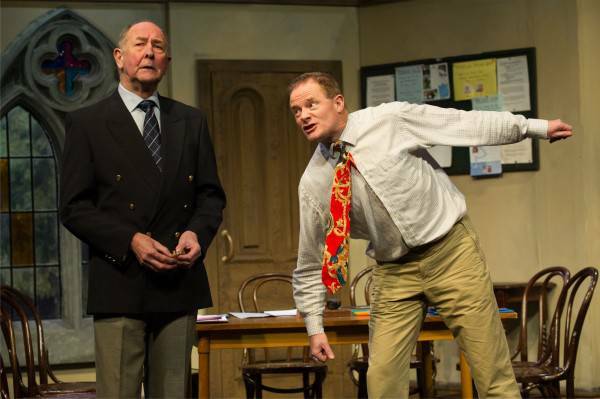 David Reynolds as the self-important David, Chairman of the Parish Council and Andrew Higson as farmer Owen who fancies the new incumbent. Another one with a glint in his eye is Hugh Everett as Hugo, David?s not very bright son, who falls for Alice. 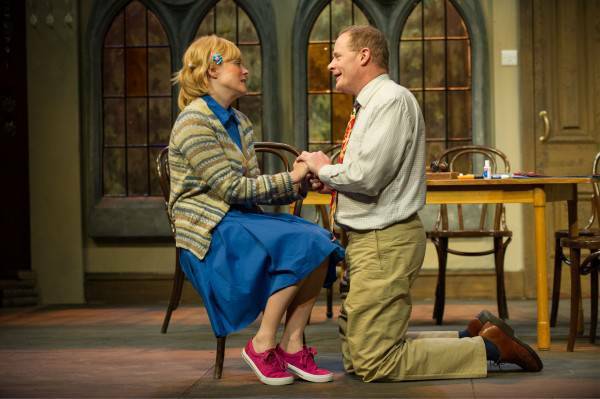 I love the scene where, egged on by the vicar, they enjoy a marathon of a first kiss! Director, Celia Bonner, includes the programme?s beautiful version of psalm 23.? It brings back memories to the audience.?? After all, that is what they are here for. The ?highlight is the wedding of Alice and Hugo.?? What an amazing dress it is with love hearts all over it! The programme proudly includes a letter from Ian Gower mentioning? that royalty monies will go to Comic Relief. We, too, enjoy comic relief. 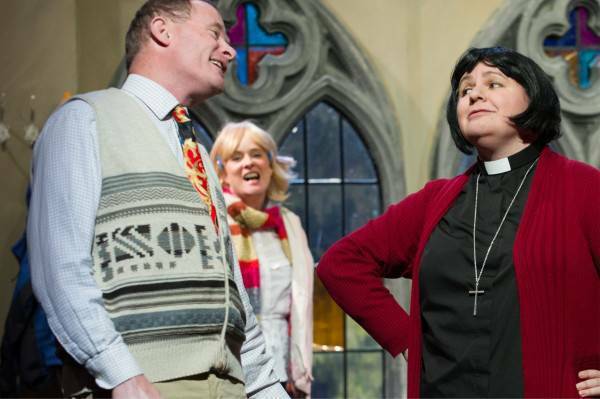 So far this season, the Garrick box office have had exceptional responses to the selection of ?plays and musicals for this special season and judging from the turn out for The Vicar Of Dibley, this has clearly added to the list of success! Long may it continue! This warm and faithful stage adaptation of the popular BBC sitcom has jumped on the same trolley as ?Calendar Girls? with an appealing charity attraction. The writers of the TV series have pieced together the shows most loved and memorable scenes to create a full length piece of theatre and are donating all of the royalty fees to Comic Relief. The script doesn?t particularly translate very easily as the scenes are quite short and don?t flow into one another particularly well, but - the success of this piece can only rely on how well the actors impersonate these recognisable characters and Director, Celia Bonner was certainly aware of that factor! Doing one thing we were always taught not to do; imitate the original! Being a huge fan of the TV programme it was evident how each player had studied the madcap bunch of characters; from the delivery and vocal infliction of the sentences to the length of the pauses, of course the blocking, each of the characters gestures and mannerisms had all been studied, every detail was exact to the show which added to the comedy. 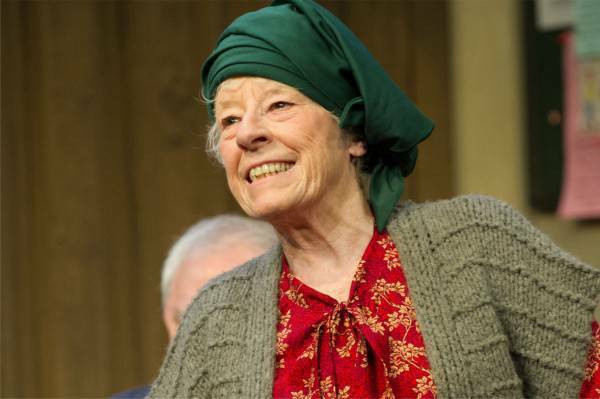 The story encapsulated the majority of the original show, from Geraldine?s arrival in Dibley (Played by Victoria Johnson), her affection for chocolate, and the love affair between nice-but-dim couple Hugo and Alice. As with the TV show, all the fun was provided by the supporting cast. Stern councillor David Horton was played with plenty of stiff upper lip by David Reynolds, aghast that his son Hugo (Hugh Everett) was set to wed barmy Alice (Ali Davenport). All of the famous characters were very well executed but farmer Owen Newitt (played Andrew Higson) delivered my personal favourite and I?d say the most accurate interpretation of these characters to the stage, closely followed by Hugh?s Hugo! Each of the many scenes provided a belly-laugh or two, all of which culminated in a wedding that had to be seen (?.again) to be believed. It was a riotous ending to an extremely enjoyable adaptation of a much-loved series. 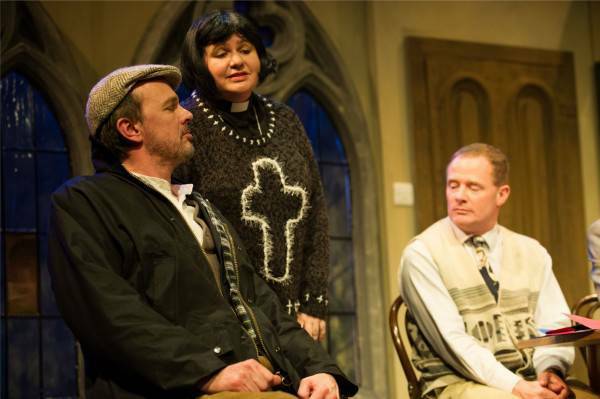 For me, The Vicar of Dibley broke the mould when it comes to so-called gentle comedy. The characters felt very real and the script could be a little bit naughty at times, while never offending anybody. Geraldine Granger was the central character, a fun and feisty cleric played to perfection by Dawn French. Altrincham Garrick is about to perform the stage version of the much-loved sitcom, with Victoria Johnsonn as the lovable Geraldine. Victoria insists she won?t be trying to take off French. But her performance won?t be too different from the original. She said: ?It?s a bit scary and there?s quite a lot of pressure because everybody knows what they?re expecting. But we?re having a really good time rehearsing it.? Victoria said the stage play is a selection of snippets from the long running TV programme, starting with Geraldine?s arrival in the village and the ensuing shock expressed by the male dominated parish council. The picture postcardm village has never had a lady vicar, you see. She said: ?It?s a brilliantly funny role and I tend to do comedy parts anyway and it?s just perfect for me. There are some brilliant lines. I also like it because it?s quite an ensemble piece and everybody?s got a good part. ?